For thousands of years the Dragons have ruled the world of Erien, but their domain has become infested by other races - Elves, Dwarves, Fae, and worst of all, humankind. The dragons have done what they can to slow the process but the humans bred like rabbits and the other races weren’t much better. It didn’t take long for the inevitable conflict over resources to begin and the dragons soon realized that they didn’t stand a chance against the combined strength of the new races. Those dragons that survived are now forced to fight amongst themselves for food, a home, breeding grounds and anything else they want. They have taken to the skies to battle it out with others of their kind, knowing only the strongest amongst them will survive to become the lords of the skies. 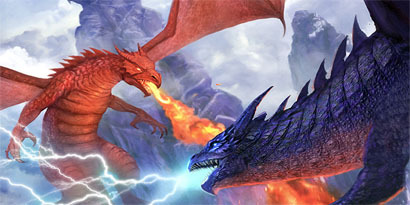 Players take on the role of Dragons as they battle against one another in the skies over Erien. Their old sense of pride and self-importance mean that they must have the best feeding grounds available even if it means fighting other dragons to get it. The game uses a system where at the start of each turn the players plot out their dragon’s movement for the turn. Movement is truly 3D allowing the dragons to fly up, down, left, right or any combination of directions. Elevation is tracked with stacking tiles and turns are shown with angled tilt blocks. Then with a bit of luck as their plans unfold on the game map their plans will have put them in to a better position to strike either with breath weapon or claw.